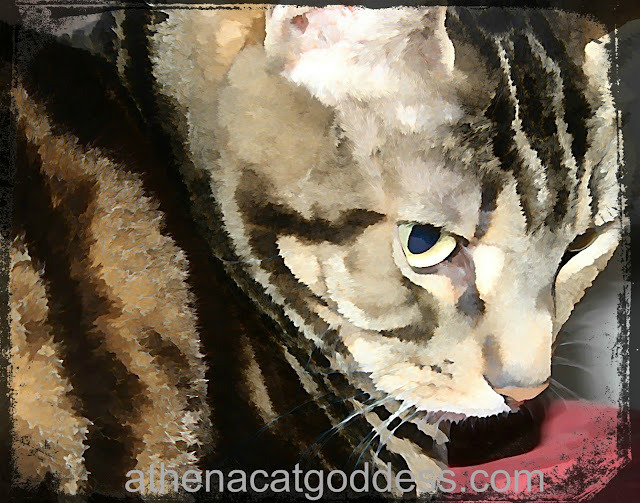 For today's Caturday Art we used Be Funky underpainting effect and added a grunge frame to finish off. I forgot all about that site. That looks like a pretty painting. Me like. I think this one is one of my all time favorites! LOVE it! These are especially arty effects today! It's one of my favorites too, I just love this! Happy Caturday Athena & Marie! Hi! We like those effects! We just were a tad lazy and recycles and oldie from our archives, MOL! Awesome rendering today! Sorry but we couldn't figure out how to get the linky-thing to work, is it a new one, wouldn't copy/paste for us today. Anyway: happy weekend one and all from Zoolatry. That's great....we're going to have to try that site!! We don't know what's happened to this linky thing. It's annoying us too. It used to work before. Sorry you are having problems. Athena looks wonderful with those effects, but she always looks beautiful. Wonderful job, Athena and Marie! What a beautiful work of art. Very nice Athena and Marie, we love the underpainting effect. You always look so beautiful Athena! I really like that painting program- it keeps just the right amount of detail. Athena is looking very natural with this art effect. Athena! Mes Gob Smacked!!! Yous gorgeous darling!!! Thank you all for you lovely comments and thanks for joining us for Caturday Art. We really appreciate it!